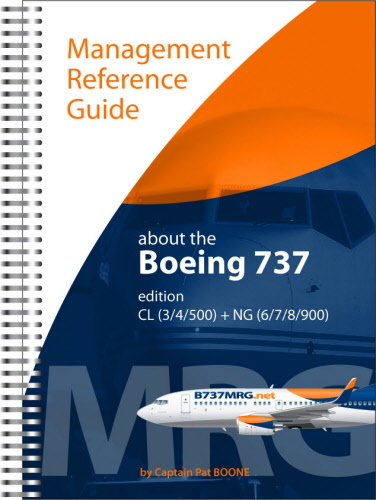 The Management Reference Guide is a useful tool for airline pilots operating the Boeing 737. Check out the 40-page demo-file to have a look inside the guide. The MRG covers all QRH-items and many more, reaching over 300 non-normals in total ! Check out the table of contents file. The MRG is printed pocket size A5 (21 x 15 cm / 8.3 x 5.8 inches) and is plasticoil bound. The guide is protected by a durable 1 mm - 0.04 inch thick transparent cover to carry this guide around the world.